Red Copper's Square Pan: Does it Really Make a Difference? Should You Buy A Square Copper Pan? Chances are, most of the pans you have in your cupboards are round. Even if you purchased the massive 10 piece set of these units, you'll find that every piece of cookware found inside is round. Square pans are not nearly as common, and generally not something most people feel they need. In spite of all that, the "squaredance pan" is one of the most popular products that this company makes. So, what makes it so special? To find out, we had to try it out for ourselves. Fits 40% more food than a round pan, and cleanup is easy thanks to the non-stick surface. The round base allows heat to be evenly distributed across the cooking surface, and it works with induction. Costs the same as a round pan, making this a good choice for people who need to cook larger meals. Although the shape is a little unorthadox, the design allows you to fit a lot more food. For example, you can cook four burgers at the same time while you'd only fit three on a round pan - so you're using the space more effectively. One of the main reasons that people buy these pans is because of their impressive non-stick coating. And just as we found with the round pans, this performs very well. There are a few concerns about durability, so continue down to our full review to learn more about the pros and cons. Now that you've got an overview, let's go more in-depth. First question: why would you pick one of these over any other pan? Well, there are a few key reasons. The most obvious benefit is the non-stick surface. This kind of cookware is made from ceramic, and coated with a special copper-infused non-stick coating. This coating is much more durable than teflon, and food simply doesn't stick to it. Cleanup is usually a matter of just wiping a paper towel over it, and some consumers even choose to cook their food without any butter or oil. The next reason you might want one of these particular pans is their shape. Have you ever struggled to cook a bunch of burgers at the same time? Wish you had more surface area to cook your vegetables evenly? A square pan could come in handy. The unique design allows a round burner to distribute heat evenly onto a square cooking surface - something that not many other square pans do. Do they actually work as intended? In many ways, yes. But for others, not so much. Notes: This pan is large enough to grill four standard burgers at the same time. It's the most compact of the options, and also one of the most affordable. Notes: This mid-size option only adds a few extra inches, but it makes a big difference. 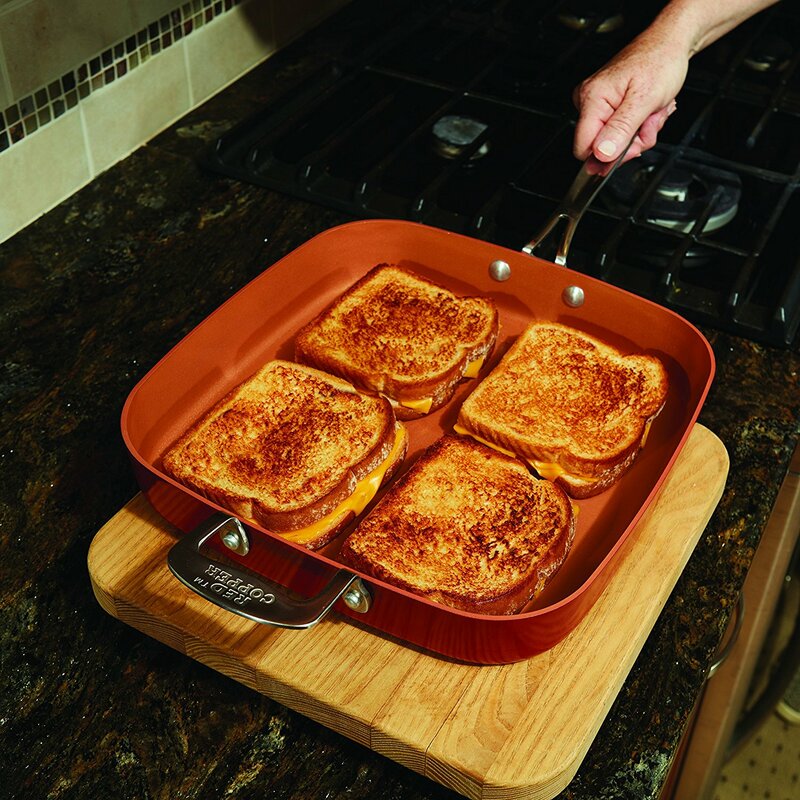 This pan is large enough to grill four standard sandwiches at the same time. Notes: Even thought it's not any wider than the other ones, it's significantly deeper. This pan comes in a five piece set that allows you to deep fry, bake, steam, roast, and boil. So, what do we think of them? As with any as seen on tv product, there are some things we love, and others we're not incredibly fond of. To answer this question as thoroughly as possible, let's look at it category by category. This is one of the things that we love - you just have so much more space with a square pan! This is most obvious when you're cooking things side by side. Food like paninis and burgers just line up side by side. There is no wasted space in the corners, so you can get your meal prepared much faster. If you're cooking something like stir-fry, the square shape doesn't really come in very handy. But where it really excels is for individually portioned meals. You'll fit more burger patties, chicken breasts, or whatever it is you want to fry up. For foods like these, a round pan just isn't ideal. 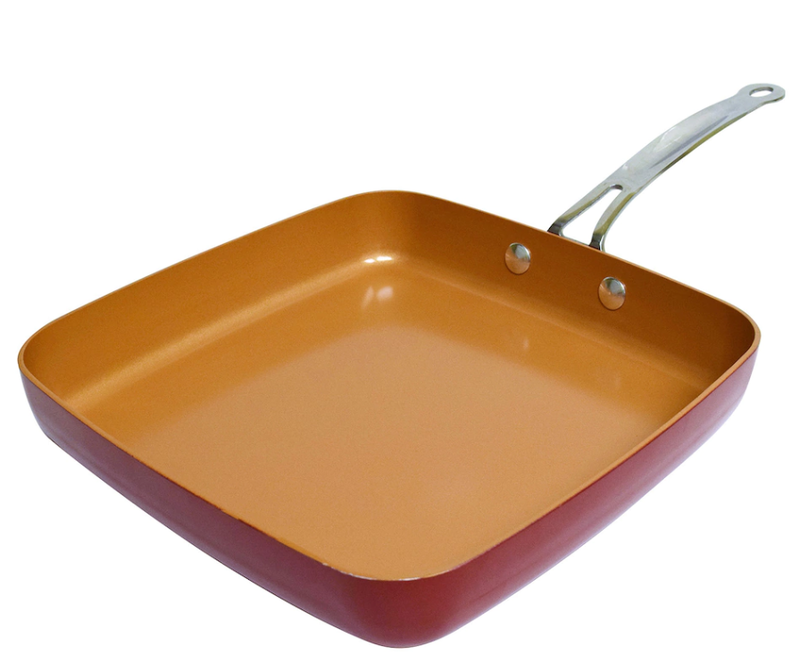 The unique coating is one of the main reasons that you might want to choose a copper pan. They simply work better than teflon. 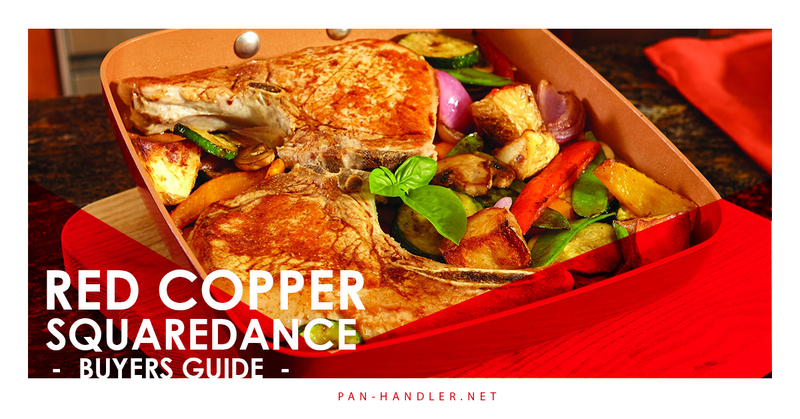 If you're looking to make health-conscious choices, copper pans allow you to prepare your food without using any butter or oil. With other pans, you'd never dream of cooking without any grease because it's going to make flipping and cleaning a nightmare. But with this coating, you're able to get away with it. That being said, cooking without any oil isn't the same as cooking with it. You'll want to move your food around occasionally to prevent it from getting backed on. But as long as you shift the ingredients around every 90 to 120 seconds, you won't have things falling apart when you move it. Where we noticed this coating the most was during cleanup. We never had to scrub our dishes very much. Cleanup was usually a simple matter of running a paper towel across the surface of the pan to remove any debris. Cleanup took less than half the time we were used to with teflon. There are another couple features this pan provides. For starters, you can use it in the oven! It's safe for temperatures up to 500 degrees Fahrenheit, so it should fit most of your baking needs. We found we used this most when preparing a larger meal. We could take something off the burner, and toss it in the oven at 150 degrees to keep it warm. But many people also use these pans for baking. If you're choosing a larger square pan, we'd highly recommend getting one with two handles. You can find ones that have the standard long handles on one side, and little metal grip on the other. This makes it easy to take a hot pan in or out of the oven, as doing so with just a single handle can be a bit tricky. So, why is it that these pans can go in the oven when other non-stick pans cannot? It has to do with the ingredients. Teflon contains a chemical called PFTE. PFTE is totally safe in most situations, but when heated in a certain way it can release PFTE gas. This gas gets into your food and can be toxic. Additionally, venting PFTE gas ruins your cookware. Because the copper infusion replaces PFTE, these pans don't run any risk of gasing when used for baking. We had mixed opinions on the durability of these pans. If you watch the infomercials, they look basically bulletproof! You see them sliding around screws and bolts without even getting a scratch, and even some images of the cookware being run over by a vehicle. In reality, this isn't entirely true. Like any non-stick pan, they rely on a smooth coating between the core and your food. If this coating gets damaged, the coating can start to chip and peel off. Because copper is a metal, this coating is more durable than some of the more common coatings out there. But copper is a very soft metal. If you abuse it, you CAN ruin this pan. As long as you follow these precautions, you should be fine. First, never use metal utensils with your square copper pan. These can scratch the surface. Additionally, you should make sure you season your pan before hand to seal everything together. Seasoning involves throwing a little oil or grease in the pan (we use bacon grease!) and coating it thuroughly. Then, you just throw it in the oven for a while to let the grease bond with the surface of your cookware. This will protect the longevity of it, and help prevent scratches. But we do have one complaint that you should be aware of: these pans don't last forever. After 2 to 3 years, the coating will start to degrade. It will still work as well as a teflon pan, but it won't be quite as good as you remember. Around the 5 year mark, you're going to want to replace it. These products are pretty affordable, so in our eyes there is still good value here. But if you're looking for something that's going to last you decades, you'll want to spend a little more money. 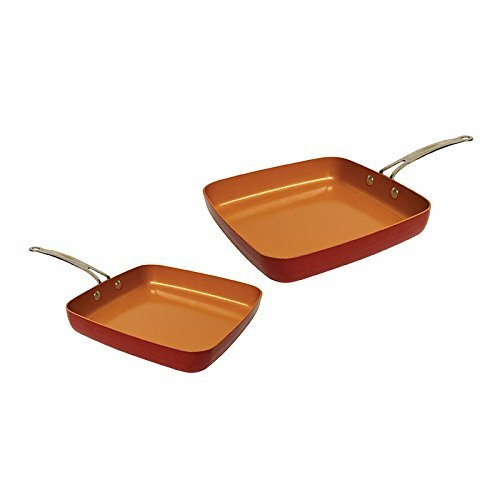 Is the red copper square pan worth buying? In our eyes, absolutely! While we wouldn't recommend getting a full set of square pans, it's great to have one around the house. We often found that when we were cooking a meal that just wouldn't fit in a single pan, the square one bailed us out. 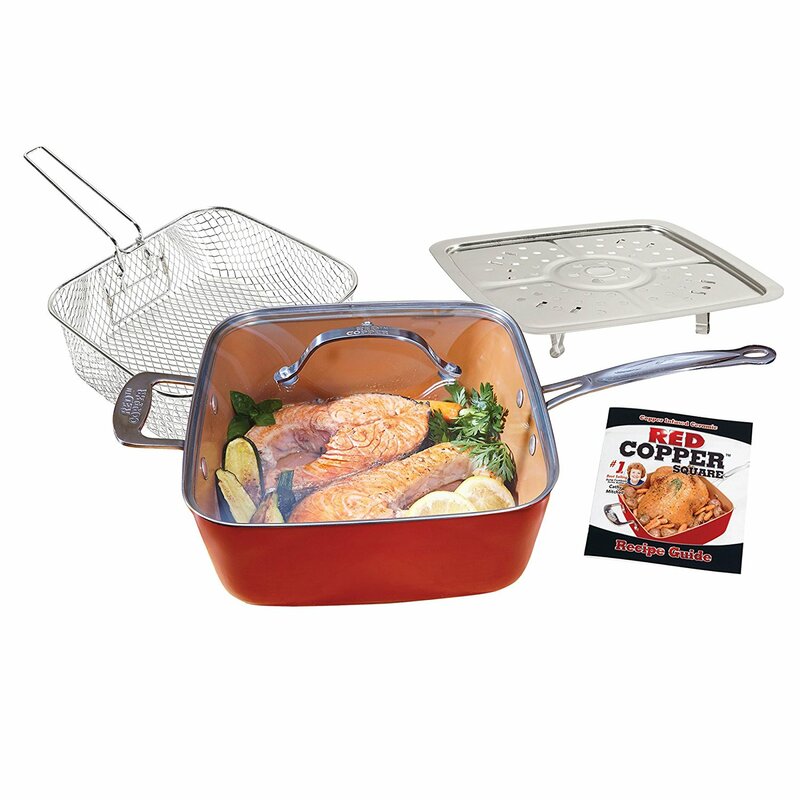 We like these units for the same reason we like the rest of the red copper line: they have excellent non-stick performance, and they are very versatile and easy to use. They might not have the most durable coating in the world (that award goes to cast iron!) but they serve a purpose that no other cookware can come close to.